Erika lives by trusting that miracles are waiting around every corner. She has been teaching yoga since 1995 and built Cloud Nine Yoga School in 1999, seeking to create a healing environment through a permission-based model for learning the practice of Yoga. She does this through affirmation, reflection, humor, music, poetry, and prayers. Erika inspires people to find their own source of wholeness by asking the deeper questions that bring personal insight, community awareness, and connection with the Great Spirit. A globe-trotter, Erika has extensively studied with teachers around the world, traveling to learn all she can know about people, culture, ecology, and art. Her adventures have led her to China, Japan, Bali, India, Europe, Tahiti, Australia, Peru, Costa Rica, and Hawaii. Erika has studied with the Dalai Lama of Tibet and received the Amitabha and Medicine Buddha initiation. She’s been certified as an Advanced Yogacharya by the White Lotus Foundation and been assisting at the Esalen Institute with Dr Lorin Roche, author of The Radiance Sutras. Her degree is in Transpersonal Psychology with emphasis on Yoga Therapy from Sonoma State University, California. Erika is a Karuna Reiki Master-Teacher and Ordained Reverend by S.H.E.S. – the organization for Spiritual Healers and Earth Stewards. 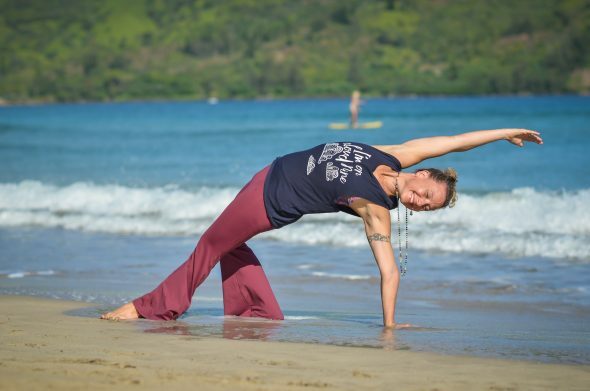 Erika held a full-time lecturer position in Kinesiology & Comparative Religion at California State University Fullerton through 2008 and has been a Director of Yoga Teacher Trainings and Retreats for Cloud Nine Yoga Schools for over 20 years. She generously provides the personal attention and leadership to all her students, colleagues, and organizations — from her affiliations with Breathe for Change, Surfrider Foundation, and OG Yoga to the everyday students who come to her to receive personalized “Edu-vacations” in her lovely home on the Garden Isle of Kaua’i. As a Yogini and quiet activist, Erika is a tremendous balancer, space holder, and friend. She sees all conscious action as a dedication to the well-being of the planet and all life everywhere. Her focus has always been on the transformative ability of art, music, movement, and the gathering of people to bring light into Life. These modalities taught her to create healthy relationships, becoming the cornerstone of her own mental health. Erika is currently writing articles on daily activities to mend our human hearts and researching the philosophical commonalities between people across the globe.